UPPER EAST SIDE — The first Citi Bike stations rolled out on the Upper East and Upper West sides on Tuesday morning. 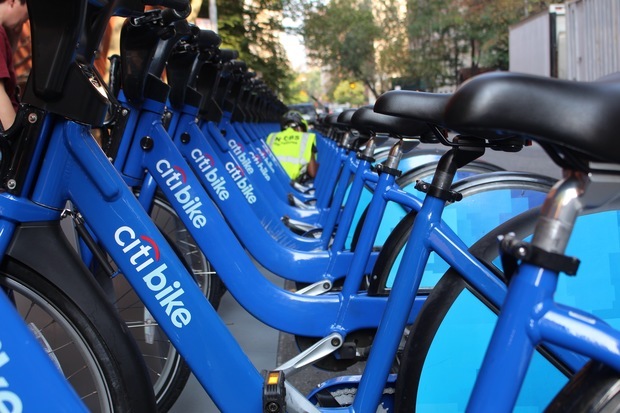 Commuters can now pick up a Citi Bike from two brand new stations at East 67th Street and Lexington Avenue, and West 63rd Street and Broadway. The rest of the locations are expected to be installed by the end of this month, according to Citi Bike General Manager Jules Flynn, who spoke at a gathering with city officials at the East 67th Street station on Tuesday. To celebrate the opening, City Councilman Ben Kallos is offering Upper East Side residents who are not yet members and who attend a bike safety class a free day pass and a $25 discount on annual memberships, which usually cost $149, he said. The classes typically take place once or twice a month at Kallos' 244 E. 93rd St. office, with the next one scheduled for Sept. 24 at 6:30 p.m.
Those who are already Citi Bike members and participate in the class will get an additional free month toward their annual membership, according to Kallos. The DOT reviewed hundreds of comments from residents over the course of several months about the placement of the bike stations and recently unveiled maps on its website for both neighborhoods in July. Only five sites between the two areas were relocated as a result of public comment, according to the DOT. But some residents were still skeptical of the placement of the new stations on Tuesday, including Gary Schwartzman, who called them "far from ideal." "I think the amount of area it takes up on city streets is taking away from the ability of people to not only get around on the street but to get a cab. It disrupts key traffic patterns," Schwartzman said. "This is not Amsterdam." For more information about Kallos' future safety bike classes, and to RSVP, visit his website.